Sometimes, driving is the family vacation — not to mention a cheaper alternative to flying with kids. So, let out your inner Clark W. Griswold and load up the fam for a vacation along “Holiday Road.” These are the best family road trip destinations in the U.S. Some of the most idyllic stretches of coastline are located in the Pacific Northwest, making Oregon and Washington perfect road trip destinations for families. Start by driving some of the 362 miles of coastline on Highway 101, where you'll encounter some of the most varying coastline in the country, including miles upon miles of dunes at the Oregon Dunes National Recreation Area, rocky cliffs, stretches of beautiful forest, and lighthouses galore. And after making your way up the coast, stop off at Cannon Beach, one of Oregon's most picturesque (and family-friendly!) beach areas. After you leave Cannon Beach, hop right on Route 26 East and cruise down into Portland, where you'll find tons of family-friendly fun, including the Oregon Zoo and the Portland Children's Museum. 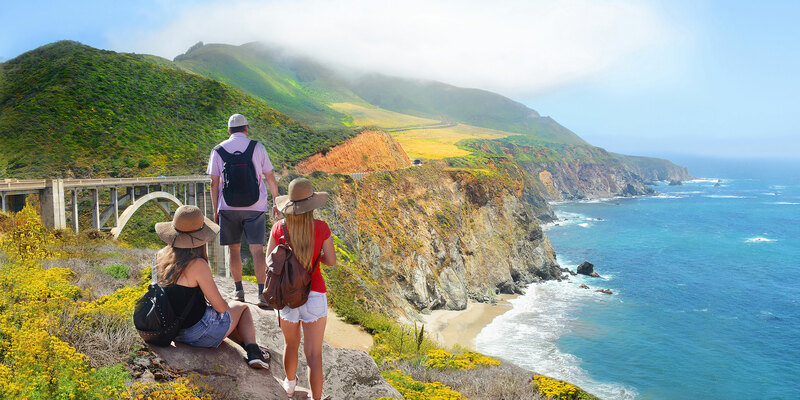 Following the twisting coastal drive along California's famed Pacific Coast Highway and through Big Sur -- often referred to as heaven on earth -- tops many a must-do family road trip destination. Begin your adventure in San Francisco and visit its attractions, including Alcatraz and Pier 39 for seal watching, then take the scenic route as you drive and stop in picturesque towns such as Santa Barbara and visit legendary sites like the Hearst Castle. End the trip in Los Angeles, and take a stroll down the Hollywood Walk of Fame, learn about movie making in Universal Studios, and visit the house of the mouse, Disneyland, in nearby Anaheim. Between Miami and Tampa lies the unique ecosystem that is the Everglades, home to alligator, boar and Florida's endangered panther. Alligator Alley is a lonely stretch of road through the Everglades, providing your family with a chance to partake in the national park's programs or ride an airboat. Indian reservations offer stopping points, welcoming guests to their tribes to watch Native American rituals. Start the journey on the beach in lively Miami for sunrises on the Atlantic Ocean, and end the family road trip in Naples for spectacular sunsets on the Gulf. Of course, don't forget to enjoy a taste of both Southeast and Southwestern Florida attractions, such as Busch Gardens and the Miami Seaquarium. This Mid-Atlantic history tour shows the kids where their history books come to life along I-95, which connects Alexandria, Virginia, Washington, D.C., Baltimore, and Philadelphia. Along this family road trip destination, you can visit George Washington's Mount Vernon, visit one of the nation's 19 free Smithsonian museums, hop aboard historical ships in Baltimore's Inner Harbor and see the Liberty Bell. With a little more time, continue up the road to New York City, park the car and ferry over to Ellis Island and the Statue of Liberty before enjoying the spoils of Manhattan. It's all about taking your time on a Southeast family road trip. Sit back and feel the breeze blowing through the pines while sipping on some sweet tea. Instead of heading north on I-95, head south for coastal exploration along the barrier islands in the Outer Banks of North Carolina, Hilton Head, S.C., Savannah, Georgia, and Amelia Island, Florida. Kayak through marshy wetlands, go crabbing along the dune-covered beaches, and watch for sea turtles hatching from numerous nests on sun-filled days. Then stroll cobblestoned streets in the South's historic cities, such as Charleston, South Carolina. Or, if you're looking to experience the less coastal side of things and see what the deeper south has to offer, check out Great Smoky Mountains, one of the U.S.'s most popular and well-traveled tourist attractions. Sharing land between North Carolina and Tennessee, this picturesque, 800-square-mile slice of American pie is seen by more than nine million people per year, and offers more than 380 miles of drivable terrain, complete with canyon loops, nature trails and beautiful mountain vistas. If you'd like to extend your journey, or just want to stay a bit closer to the coast line, take a ride down some of the 469 miles of the Blue Ridge Parkway, consistently ranked one of America's best and most scenic drives. While Route 66 is no longer fully operational, the famous highway, making its start in the heartland, can still be enjoyed in pieces. Begin the journey in Chicago, first enjoy the city's Magnificent Mile and Navy Pier. Drive through the Land of Lincoln (including the historical Lincoln Log Cabin site) in Springfield, Illinois, pass through St. Louis' Gateway Arch and continue on through stretches of the Southwest. If you travel far enough west, you'll come across our country's biggest hole in the ground: the Grand Canyon, as well as numerous scenic vistas. Follow Cape Cod's historic 6A, the original highway that remains a two-lane road, winding through the Cape's sleepy towns. From its beginnings along the Cape Cod Canal, the journey will take the family past mudflats, beaches and sand dunes, and pass through the Cape Cod National Seashore before ending in Provincetown, where a whale watching cruise can provide an up close and personal tour of the Cape's chilled waters. When you've had enough sand and surf (as well as mini-golf and homemade ice cream), hop the ferry to Boston and take in one of the country's most historic and family-friendly cities. Take the kids on a Southwestern family road trip through the desert, beginning in Las Vegas, which actually features A TON of kid-friendly fun! Pass over the Hoover Dam -- be sure to stop and take in the massive size (and stand foot in both Nevada and Arizona) -- en route to Arizona's Grand Canyon, where you can camp out, old-school style or check into a cozy hotel and embark on outdoor adventures like rafting, hiking, horseback riding and mule rides. The canyons are home to plenty of family-friendly sites and activities, including standing 4,000 feet in the air at the Grand Canyon Skywalk and hiking the canyons' North Rim.